Hello fellow Queness readers, we have this awesome WordPress Theme Giveaway again. This time, we giveaway a theme called Nuance with built-in all time famous content composer. Nuance is a theme we made with the idea to keep it simple design-wise and as flexible as possible. Like our other themes, it contains the amazing Content Composer so you can create professional custom pages in minutes! There are lots of Page and Post options that you can use to make every page unique to your needs. Congratulation! 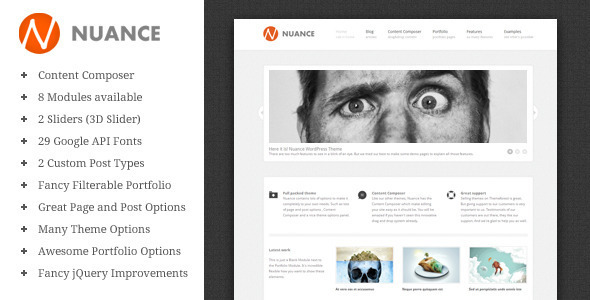 You have won a copy of awesome Nuance WordPress Theme! You should receive an email soon, otherwise, please use our contact page to let us know. great contest. I win this.